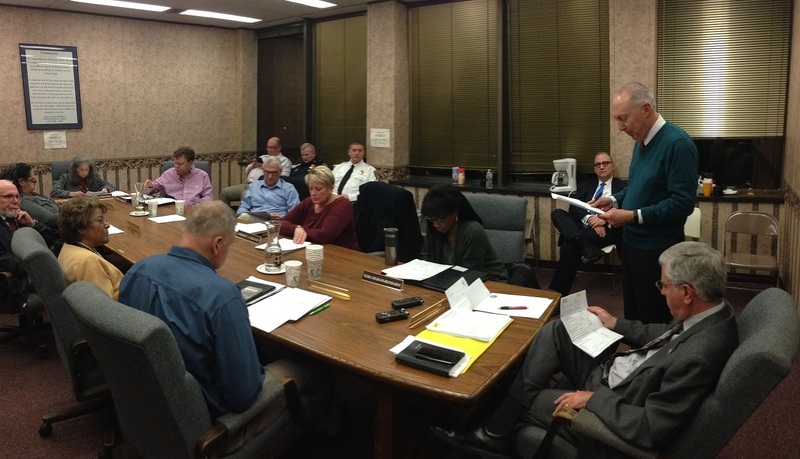 City Comptroller Joe Bellitto (standing) reviews financial numbers with the Jamestown City Council, Mayor Sam Teresi, and staff. JAMESTOWN – The Jamestown City Council received positive news regarding last year’s budget, as well as some promising signs for the current fiscal year. City Comptroller Joe Bellitto went over the final numbers for the 2018 city budget and said that Jamestown finished the year with a $416,000 surplus – marking the second year in a row that revenues exceeded expenses for the budget. For 2018, city revenue was $762,000 higher than what was budgeted, while expenses were $346,000 over budget. Jamestown Mayor Sam Teresi acknowledged the hard work of the city council and city employees for working to keep the budget balanced during the year, while also giving special thanks to the State for providing additional aid to the tune of $1 million. The mayor said had that supplemental aid not have come in, the city would instead by looking at nearly a $600,000 deficit. The public presentation of the audit came only after the city council and mayor went into an executive session. A formal independent audit of the budget will be made later this year. Bellitto also went over some of the first quarter numbers for the current 2019 fiscal year – with revenues and expenses both falling generally within normal budget range.